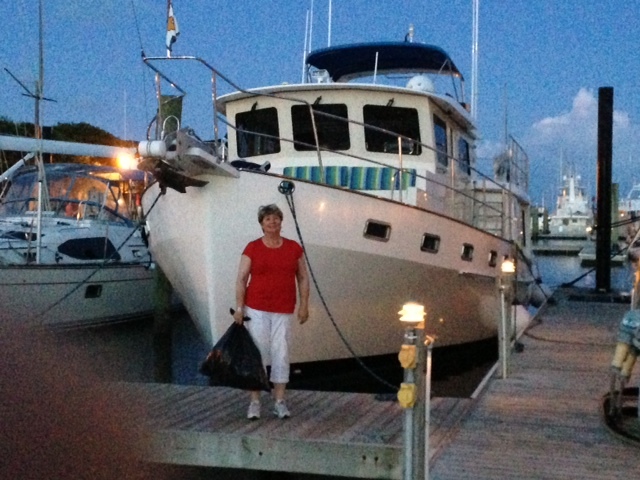 Have spent a few days in charming, historic Beaufort, NC, to avoid thunderstorms and explore the area! Here's the boardwalk near the City Marina - the city is full of wonderful restaurants and hospitable people! A wisteria vine basket on the porch of The Cedars Inn - we joined friends, Larry and TJ, for a scrumptious dinner there one evening! The Cedars Inn...just a lovely place! Larry and TJ graciously escorted us around the area to Atlantic Beach, Morehead City, and New Bern showing off some of the wonderful and historic sites. THANK YOU Larry and TJ! Jeff M: this Pepsi photo is for you! The Beaufort Boardwalk, but in sunshine this time! A quick pic on the boat.. He's sooooo handsome (the Captain, I mean)!!! And she (the boat, I mean) is a 'looker'! We toured the Beaufort "Old Burying Ground" and it was so very interesting - as there were graves from the Revolutionary War, War of 1812, Civil War days, and other times. A soldier from His Majesty's Navy from the 1700's is there and he was buried in full uniform, and standing up! There was also a little girl buried in a keg of rum! But many, many heroes from all walks of life are at rest there. A salute to a hero! 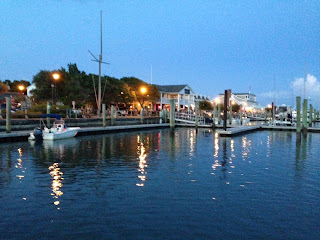 Evening...with music at the local Dockside Restaurant. We enjoyed listening to the music from our back deck! Also, when in town, check out the wonderful restaurants: The Beaufort Grocery Co. Restaurant, and the Blue Moon Bistro - outstanding entrees!